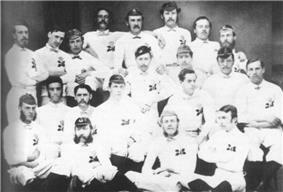 The 1871 rugby union match between Scotland and England was a single international played between the Scotland and England national rugby union teams on 27 March 1871. This was the world's very first international rugby union match, and was played at Raeburn Place, Edinburgh in front of 4,000 spectators. The match was won by Scotland who scored two tries and a goal to England's single try. The match resulted from a challenge issued in the sporting weekly Bell's Weekly on 8 December 1870 and signed by the captains of five Scottish clubs, inviting any team "selected from the whole of England" to a 20-a-side game to be played under the Rugby rules. The game was played at Raeburn Place, Edinburgh, the home ground of Edinburgh Academicals, on 27 March 1871. The English team wore all white with a red rose on their shirts and the Scots brown shirts with a thistle and white cricket flannels. Three international matches played according to Association Football rules had already taken place at the Oval, London, in 1870 and 1871. The team representing England was captained by Frederick Stokes of Blackheath, that representing Scotland was led by Francis Moncrieff; the umpires were Hely Hutchinson Almond, headmaster of Loretto College in Scotland, and A Ward from England. The game, played over two halves, each of 50 minutes, was won by Scotland, who scored a goal with a successful conversion kick after grounding the ball over the goal line (permitting them to 'try' to kick a goal). Both sides achieved a further 'try' each, but failed to convert them to goals as the kicks were missed. Angus Buchanan was the first man to score a try in international rugby. In a return match at the Kennington Oval, London, in 1872, England were the winners. This great football match was played yesterday, on the Academy Cricket Ground, Edinburgh, with a result most gratifying for Scotland. The weather was fine, and there was a very large turnout of spectators. The competitors were dressed in appropriate costume, the English wearing a white jersey, ornamented by a red rose, and the Scotch brown jersey, with a thistle. Although the good wishes of the spectators went with the Scotch team, yet it was considered that their chances were poor. The difference between the two teams was very marked, the English being of a much heavier and stronger build compared to their opponents. The game commenced shortly after three o'clock, the Scotch getting the kick off, and for some time neither side had any advantage. The Scotch, however, succeeded in driving the ball close to the English goal, and, pushing splendidly forward, eventually put it into their opponents' quarters, who, however, prevented any harm accruing by smartly 'touching down’. This result warmed the Englishmen up to their work, and in spite of tremendous opposition they got near the Scotch goal, and kicked the ball past it, but it was cleverly 'touched down' they got no advantage. This finished the first 50 minutes, and the teams changed sides. For a considerable time after the change the ball was sent from side to side, and the 'backs' got more work to do. By some lucky runs, however, the Scotch got on to the borders of the English land, and tried to force the ball past the goal. The English strenuously opposed this attempt, and for a time the struggle was terrible, ending in the Scotch 'touching down' in their opponents' ground and becoming entitled to a 'try'. This result was received with cheers, which were more heartily renewed when Cross, to whom the 'kick off' was entrusted, made a beautiful goal. This defeat only stirred up the English to fresh efforts, and driving the ball across the field, they managed also to secure a ‘try’, but unfortunately the man who got the 'kick off' did not allow sufficient windage, and the ball fell short. After this the Scotch became more cautious, and playing well together secured after several attempts a second 'try', but good luck did not attend the 'kick off' and the goal was lost. Time being then declared up the game ceased, the Scotch winning by a goal and a 'try'. ^ a b c Glasgow Herald (1871).